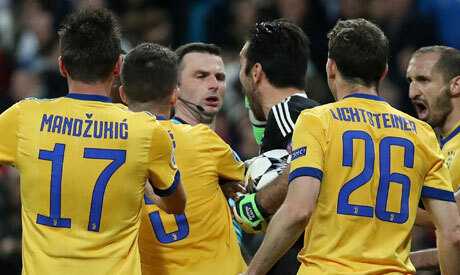 UEFA has condemned the online abuse aimed at Michael Oliver and his wife after the English referee awarded a decisive stoppage-time penalty to Real Madrid against Juventus in their Champions League quarter-final, second leg last week. "UEFA strongly condemns the abuse directed at Michael Oliver and his wife," European soccer's governing body said in a statement. The BBC reported on Sunday that British police were investigating threatening text messages sent to Oliver's wife Lucy, whose Twitter account was also targeted with threatening and abusive messages. Buffon, who was sent off for his furious protest, said that Oliver had a "garbage bin" instead of a heart. On Saturday, Buffon said in an interview that he would repeat the comments all over again but in "more civil" language. "I am a human being who puts passion, sentiment and anger into what I do," he said. Former England forward Gary Lineker was among those who said that Buffon's comments were over-the-top. "These vituperous attacks on Michael Oliver and his wife are repugnant," he said on Twitter. "Big admirer of Buffon but his behaviour since has been inflammatory and out of order. Oliver was doing his job and hard to argue against his decisions. Understand the emotion but time to defuse it, Gianluigi."